This Ham Salad recipe combines leftover ham with celery, onions, relish, mayo, and horseradish mustard to make the perfect hearty sandwich filling. Do you like ham? I mean like a ham on the bone. You know, one of those big old hunks of ham that could feed an army? I love me some juicy, salty, smokey, rustic sliced ham. Our preferred method of cooking when it comes to ham is on the grill. So darn good and so easy to prepare! You can get a ham relatively cheap and then simply throw it on the grill in a roasting pan filled with an inch or so of water. It smells so delish while it's slow-cookin' and the results are mouthwatering. There's only one problem when we cook a ham, though. There's always soooooo much left over. That's where this recipe comes in. 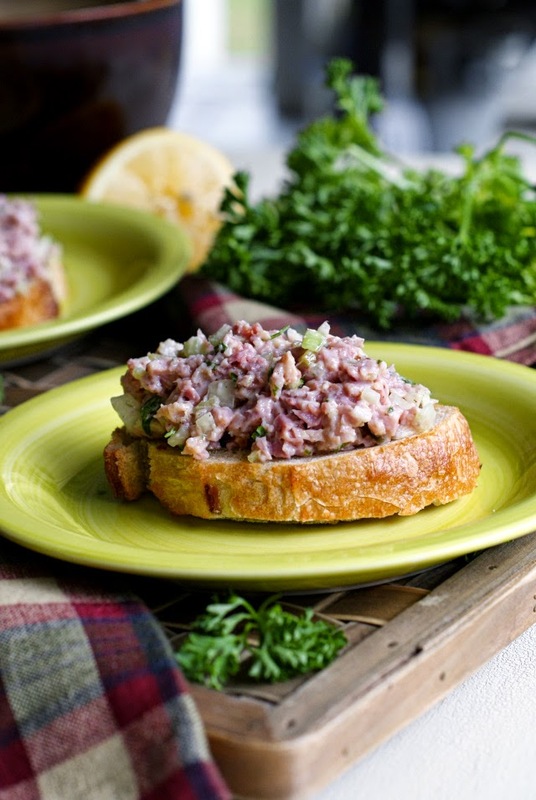 You can transform your leftover ham into ham salad! Similar to tuna salad or chicken salad, ham salad can be used as a sandwich filling, a spread, or even on a garden salad. So good, so easy, and the best way to dress up your boring ham leftovers! Mix together all of the ingredients in a bowl until thoroughly combined. Serve on a green salad, on crackers, or as a sandwich filling.